Timing is critical to harvesting high quality Northeastern hops, as is paying close attention to drying, packaging, and storing the harvest. Our hops at the Alburgh research farm are not quite ready to harvest yet. We predict that the harvest of early maturing varieties will begin at the end of next week (the week of August 24, 2015). We use dry matter content to make the final decision on harvest timing, but there are flavor-related strategies that are quick and can be a good place to start. Alpha acids develop before beta acids in hop cones. Studies of Northeastern hops indicate that we should allow cone chemistry to develop further than has been traditionally recommended in order to let these beta acids develop. This means leaving hops on the bine for a slightly longer period of time when possible. At this time of year, it is important to walk through your hop yard to evaluate hops. Do a sensory test that includes smell, touch, and sound. Hops that are not quite ready smell “green” like hay or grass, while over-ripe hops smell like onions, sulfur, and garlic. In general, you should be able to smell hops from a couple feet away from a plant when they are ready. One Pacific Northwestern grower said he knows when his hops are ready because a cone will sound like a baby rattle when shaken. This goes to show that every region and every farm has their own group of specific sensory characteristics to determine hop readiness. If you have a microscope, you can also take a look at the lupulin glands. Lupulin glands that are ready should be shiny, golden, and have an acorn shape. 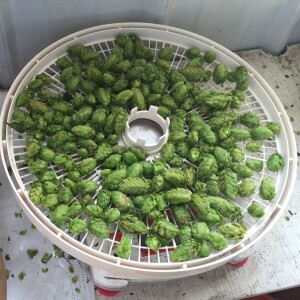 Getting ready to pop some hops in the dehydrator. 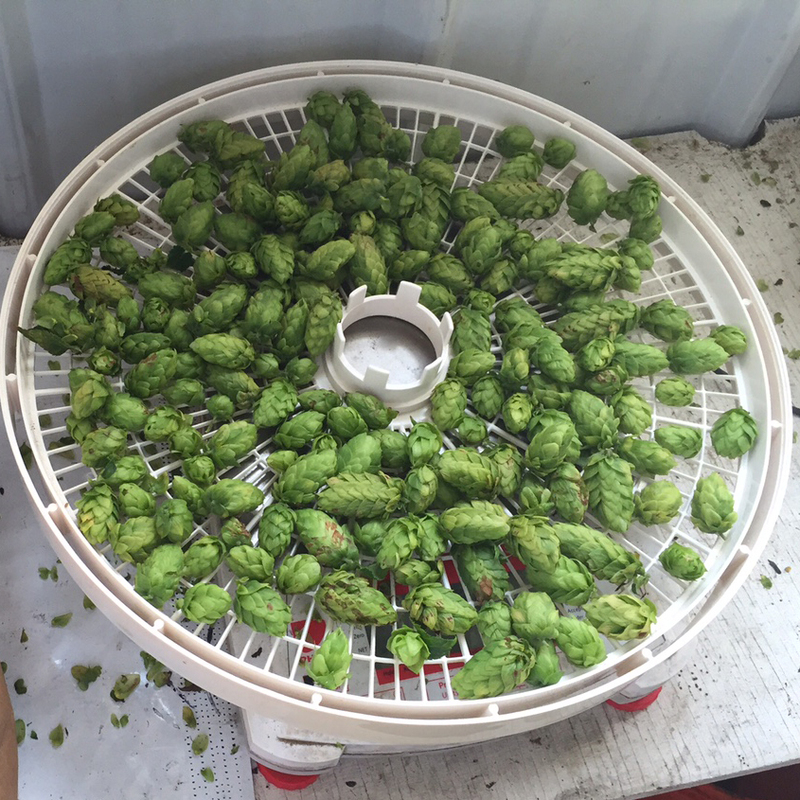 Once you think that your hops are ready, it is time to measure hop cone dry matter content. Dry matter is the deciding factor that we use to determine when hops are ready to be harvested. We harvest at 23% to 27% dry matter. It is known that different varieties can have different optimal harvest dry matters within (or just outside) this range. We highly recommend taking notes on your harvest dry matter and how your crop turns out so that you can make small changes if need be. To test dry matter: Take a 50 gram sample of wet cones from individual varieties. Make sure that a representative sample is taken from the yard at 10 to 12 feet above the ground. Weigh each wet cone sample. Place cones in a food dehydrator at medium heat or in a microwave. When you think they are dry, take a cone out. Split it open. Is it still wet? Weigh the dry cones and calculate dry matter or moisture content. Our UVM Extension Hop Harvest Moisture Calculator will calculate dry matter for you from wet and dry weights. See our website for more information on dry matter calculation, including our Hops Harvest Moisture Determination factsheet. Note: in hot, dry conditions, cones can mature and dry very quickly. In hot weather, dry matter levels can change rapidly, so pay close attention over these warm summer days! For an academic journal on hop maturation, see “The Development of brewing quality characteristics in hops during maturation,” by M. Murphey and G. Probasco, (1996) Tech. Qrtly. Master Brewers Assoc. of the Americas, 33(3) 149-159. If you are noticing black or browning cones, stay tuned for our next blog post on cone diseases. This entry was posted on Tuesday, August 18th, 2015 at 3:46 pm and is filed under Uncategorized, What's Hoppening. You can follow any responses to this entry through the RSS 2.0 feed. You can leave a response, or trackback from your own site.